Vishay Intertechnology, Inc. on April 3, 2017, introduced a new high pulse, non-inductive, fusible, flameproof metal film resistor that meets the safety requirements of UL1412. 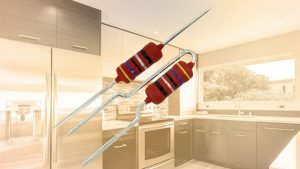 The VishayBCcomponents PR02-FS offers defined fusing characteristics at defined overload conditions and resistance values > 50 Ω to withstand 600 V surges (1.2/50 µs pulse) as defined by IEC 61000-4-5. With its defined fusing behavior and fast fusing time of < 10 s for an 80 W overload, the device released is designed to disconnect electronic home appliances such as washing machines and shaver chargers from the power supply. In addition, it provides current limiting in low voltage power supplies for indoor lighting applications. Moreover, due to its inherent non-inductive design, it can be used in applications such as snubber circuits with inductive loads. The PR02-FS offers a resistance range from 1 Ω to 100 Ω with tolerance down to ± 10 %, TCR of ± 250 ppm/K, rated power dissipation of 2 W at +70 °C, and an operating temperature range from -55 °C to +200 °C. Available in a radial version, the device meets active and passive flammability requirements as defined by IEC 60115-1 and UL 94-V0. The resistor is RoHS-compliant, halogen-free, and Vishay Green. Samples and production quantities of the PR02-FS are available now, with lead times of 8 to 10 weeks for large orders.